Right now there are plenty of gorgeous calves being born on our farm. 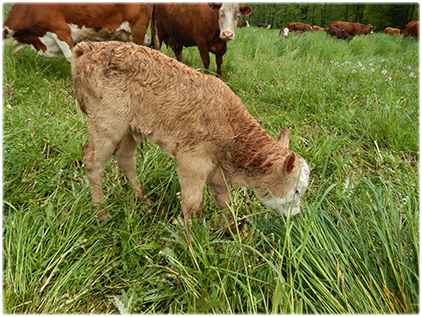 It's a good time of year to be born if you're a calf, because the Moms are starting to feed on lush spring grass which means they're getting plenty of nourishment to support themselves and their babies. Today was particularly special because we had three calves born, two of which were twins. Twins are a rarity, and we decided to capture the moment on video. Watch as these newborn calves learn to walk and toddle after their mother. They're off to a good start. The other special thing that happened today is our favorite Momma cow had her baby, a really pretty little thing which is full of vigor and life. The baby is a girl, and her Mom is the top cow on our farm because she's an excellent mother, very productive, her physique is well suited to our land, she's always in excellent health and her genetics are beautiful. Each year we look forward to her calf because her babies are always very pretty. We allow our cows to give birth out on the pasture, and they rarely need assistance. The moms prefer to find a somewhat secluded place while they're calving, and they usually remain with the calf steadily for the first day. Interesting fact: cows eat their afterbirth, even though they are herbivores. 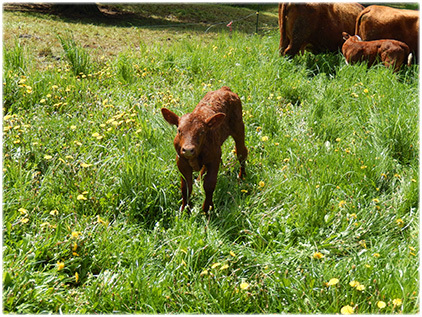 Usually the calves stand up within the first three hours or less, and begin trying to nurse. The first 24 hours are important for the calves to get colostrum from their mothers. This is a special type of milk, and it contains vital ingredients for the calves' immune systems. One of the other baby calves we had recently which we think is just gorgeous is also from the genetic line of our favorite Momma cow, this one is her "grandchild" if we can use the term. See how beautiful he is, completely brown and just as pretty as can be. It's a real joy for us when calves are being born, they're such stunning creatures. Most of our friends and customers have never lived on a farm, which is why we like to share these pictures and videos. By seeing the farm animals and how they live, you can understand how we do things, and how it's very different than conventional farms. Yes, these creatures are livestock and they ultimately have a purpose of providing our families and community with food. But what amazing creatures they are. We're so grateful for you, our customers. Thank you for supporting our local, certified organic family farm.